The Washington Trucking Association (WTA) recently presented Brown Line with the Common Carrier Fleet Safety of the Year Award for 2011. The award is based on a carrier’s accident rates, driver training, safety programs and vehicle maintenance. In addition to the yearly safety award, Brown Line Safety Director Bill Smith was recognized as one of the latest WTA members to become a Certified Safety Director through the North American Transportation Management Institute (NATMI ). Brown Line is headquartered in Mount Vernon, WA and provides temperature controlled truck transport throughout the U.S and Canada. 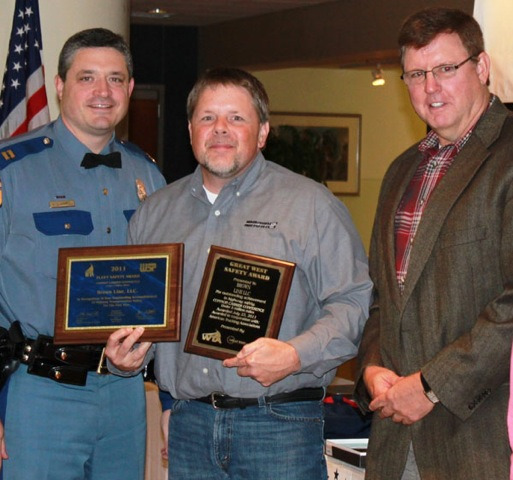 Bill is pictured holding the two awards with Captain Groondell from the Washington State Patrol and Kevin Skow of Great West Casualty.